Nothing shouts holiday quite as loudly as the aroma of ginger, nutmeg and cinnamon drifting merrily throughout the house. But those wonderful aromatic spices are not just for the holidays. Many of the humble herbs and spices we use to flavour our foods have been around since time immemorial. These herbs and spices were used medicinally by ancient civilisations in the treatment of a diverse range of conditions. These plants from nature's medicinal chest, have a plethora of natural healing ingredients that benefit our health. However, before you rush off to the shops to stock up on those exotic beauties, a word of warning. Some of these herbs and spices have a sting in the tail. When taken in excess, they can have dangerous side effects. For this hub, I chose to look at nutmeg, mace and ginger, for my next hub I will endeavour to delve into the many wonders of the incredible cinnamon. While the use of herbs and spices in complementary medicine continues to grow in popularity, comprehensive clinical research studies on the efficacy of natural treatment continue to be sparse; results are often mixed or inconclusive. Natural herbal medicine has been known to have adverse effects and should be taken with care. Some may interact with pharmaceutical drugs. Therefore, always consult your healthcare professional before taking herbal medicinal products. 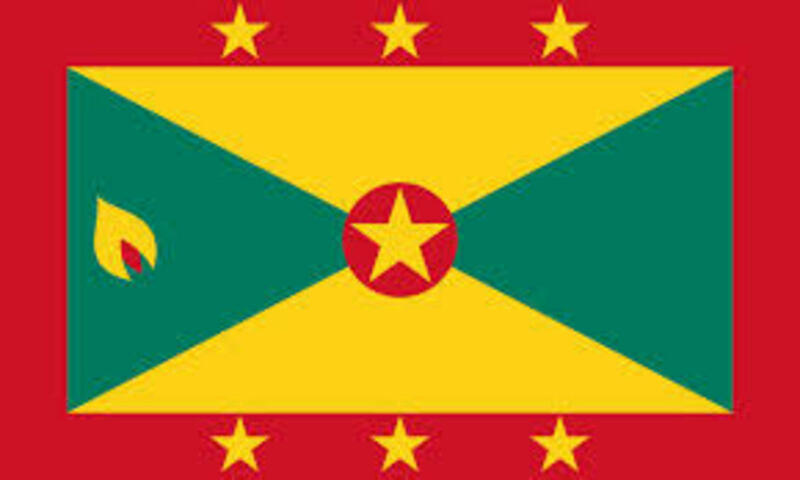 I was surprised to find that many of the exotic spices found in my local supermarket originated from my ancestral home of Grenada, also known as the 'Isle of Spice' or The Nutmeg Island. With the 17th century craze for nutmeg and the monopoly of the Asian nutmeg trade by the Dutch, the British needed to grow their own. Grenada's climate of high humidity and high annual rainfall proved to be ideal for growing the valuable spice. The two largest producers of nutmeg today are Indonesia and Grenada in the Caribbean. Grenada is known for its top quality nutmeg and mace; this buoyant industry contributes to the livelihood of many Grenadian. 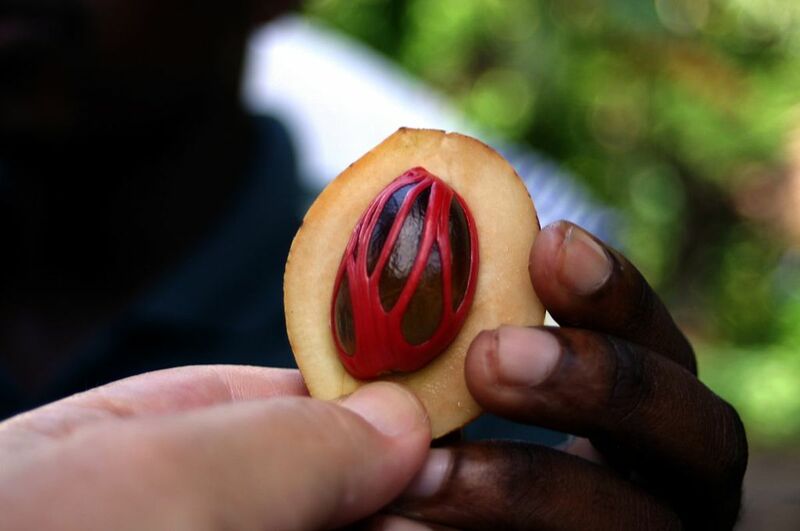 While visitors to Grenada are advised to enjoy the beauty of the island but leave nothing but footprints, taking home a piece of paradise in the form of nutmeg, cloves, cinnamons and mace are positively encouraged. Nutmeg is one of the oldest spice known to man. 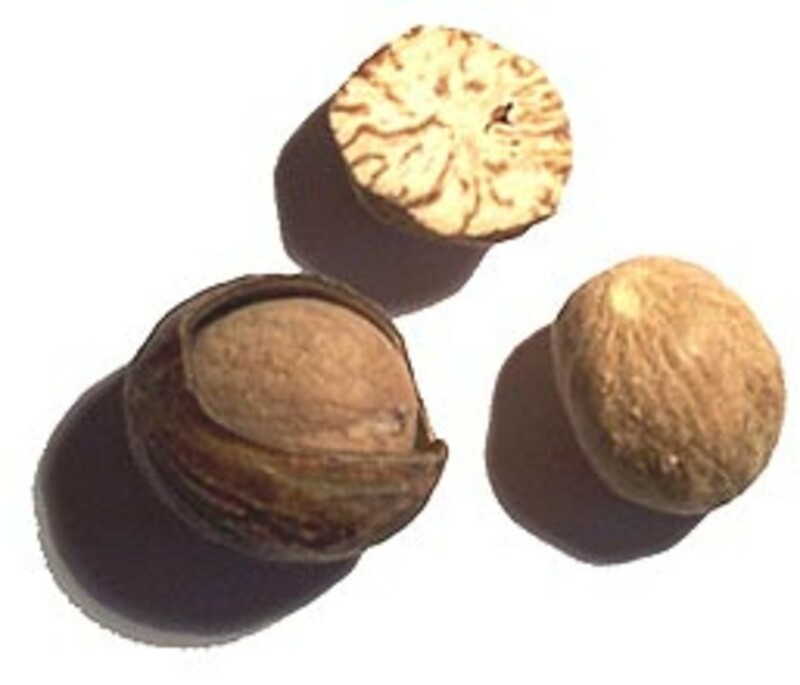 In the first century AD., Roman author Pliny described a tree bearing nuts, having two separate flavours, historians now believe that Pliny might have been describing the nutmeg tree. Pepper, clove and nutmeg have been referred to as the original holy trinity of the Asian spice trade. Nutmeg was brought to Europe by Arab traders from the Moluccas through India. However, the source of the precious spice would remain a closely guarded secret. The Moluccas was not mentioned by the spice traders as the source of nutmeg until 1300 AD. Physicians in Elizabethan London promoted their nutmeg pomanders as the only sure cure for the plague. That is how highly the Europeans regarded the nutmeg spice. The European valued nutmeg spice above gold; they fought wars for control of the nutmeg-producing Indonesian Islands. 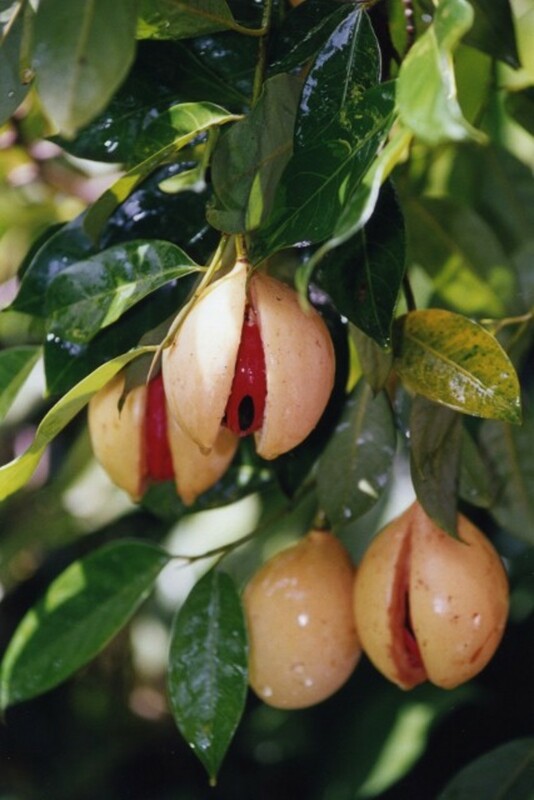 Many of the islanders were killed and enslaved in the pursuit of nutmeg. Nutmeg became a valuable commodity that only the rich were able to afford. When King Henry Vl of Germany was crowned Holy Roman Emperor in Rome, it was reported that the streets were fumigated with nutmeg and strewing herbs. The history of nutmeg is nothing, if not colourful and cruel. Nutmeg was at the centre of the spice war. The Banda Islands in the Indonesian province of Maluku were once the world's sole producer of nutmeg and mace. Around 6th century AD, Arab traders introduced nutmeg to Europe, channelling the precious commodity through Venice. Once there, the spice would be sold to wealthy Europeans and particularly the aristocracy. By the 12th century, nutmeg was well known throughout Europe. Columbus' men famously charged the shores of south-west India, now known as Kerala in 1497 crying "For God and spices!" The Portuguese explorer Vasco da Gama cunningly duped the Arabs by sailing around the Cape of Good Hope in 1498 to reach the spice markets of India. Portuguese navigator, Afonso de Albuquerque built a fortress on the Indonesian Maluku islands where nutmeg was grown, helping to monopolise the world's nutmeg trade. This monopoly lasted a century. For years, Spain and Portugal fought for control of the spice trade. The English and the Dutch followed close on their heels. 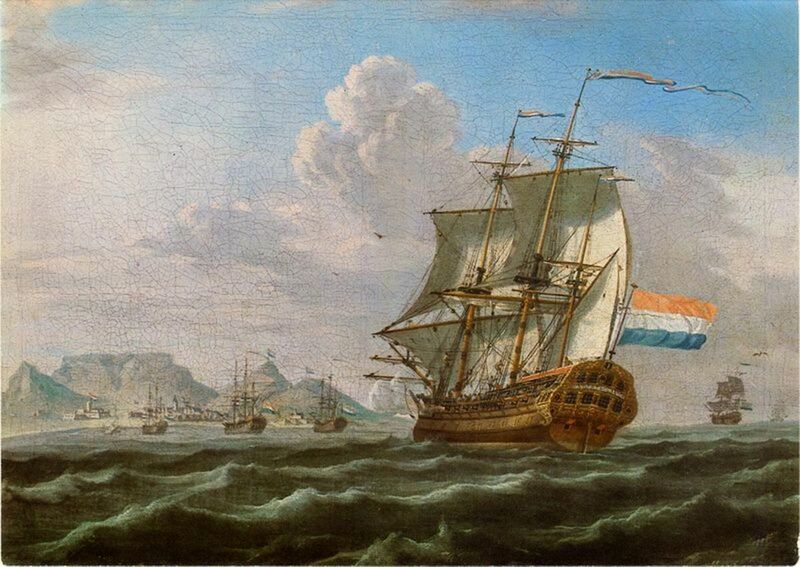 By 1617, the Dutch East India Company was the world's wealthiest commercial operation. The Dutch gained the monopoly by employing extreme barbaric practices. Once in control of the group of Indonesian islands known as Banda, the Dutch kerbed resistance by the Islanders by executing every male above the age of 15. The village leaders were beheaded and their heads displayed on poles, this served as the discouragement to others. Natives caught growing nutmeg or carrying seeds without authorization were summarily executed. Not only was nutmeg a favourite for flavouring food and drinks in Medieval times, but the spice was also widely used by the wealthy in an attempt to prevent the plague. Ladies carried sachets of nutmeg around the neck for protection and to avoid breathing the bad air. Posies of tobacco, flower petals and nutmeg were used to mask the stench of decay while men added the spice to their snuff to inhale the aromatic scent and no doubt for a little inebriation. At the turn of the 19th-century nutmeg was gaining a reputation as an abortifacient and stimulant to induce menstruation. The first recorded incident of nutmeg's inebriating properties occurred in 1576 when a pregnant woman became delirious after consuming a toxic dose of between ten and twelve nutmegs (Stein et al. 2001). The psychoactive qualities of the spice only came to light because of its reputation as an abortifacient. Myristica fragrans Houtt, commonly known as nutmeg or Pala in Indonesia, is an aromatic evergreen tree belonging to the plant family Myristicaceae. The fruit of the nutmeg tree is firm, pale and yellowish in colour, quite edible often made into jam. But the real prize is the dried seed kernels containing not one, but two spices. Nutmeg was once called a "nervine," due to its ability to nourish, calm and soothe the nerves, relieving tension, stress and anxiety, and has been used to relieve headaches. 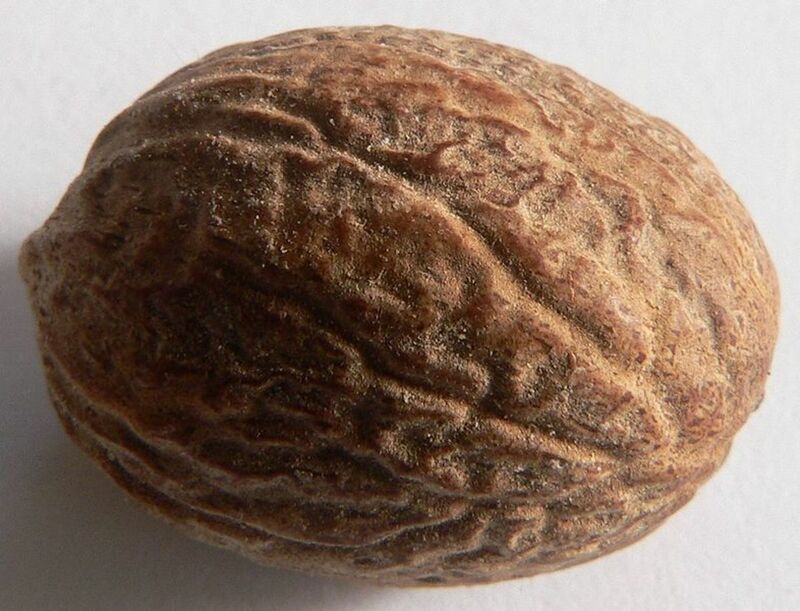 Nutmeg seed is roughly oval in shape and about 15 to 18 mm wide. 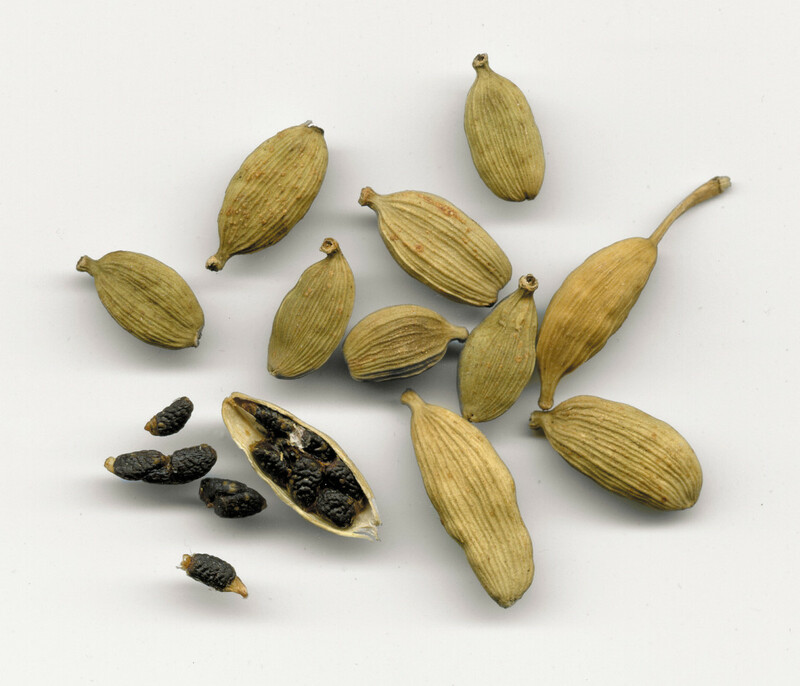 It is this seed with its pungent aromatic flavouring we know and love as nutmeg. Nutmeg plays a significant role in folk medicine, often used to treat skin conditions like scabies also general respiratory diseases, colds, fever and catarrh. Recent studies have shown that macelignan found in nutmeg and mace can help to treat and prevent certain types of cancers. Potent antioxidant and anti-inflammatory properties of macelignan also make nutmeg an effective antiphotoaging agent. Controlled laboratory studies show Myristica Fragrans or nutmeg contains insulin-like properties also insecticidal, antibacterial and antioxidant activities to name a few. But conversely; although nutmeg is considered safe when used in food for flavouring, studies show that prolonged use of nutmeg can cause degenerative changes in the kidney, liver, heart and spleen, and can also cause auditory problems when taken in high dosage. The natural compound found in nutmeg known as myristicin acts as a serotonin agonist, it is believed that myristicin may inhibit monoamine oxidase with amphetamine-like stimulant effects. Care should be exercised when using nutmeg. The toxic dose of nutmeg is said to be about two to three teaspoons, likened to LSD and can last for one to two days. However, people who took nutmeg in high doses for the buzz often do not repeat the experience because of the dangerous side effects. About 30 to 60 minutes after taking large doses of nutmeg, gastrointestinal reactions such as nausea, vomiting and diarrhoea can occur. Hours later heart and nerve problems can result. According to a representative for the Georgia Poison Center in Atlanta. “A person who has an unrecognised heart ailment could have problems that could lead to irregular rhythms." While nutmeg is safe as a food flavouring it should not be taken in large doses. Always discuss with your doctor before taking medicinal herbs and spices. The second spice of the nutmeg plant is the mace, a dry outer reddish brown lace-like covering that snugly envelops the nutmeg seed. Nutmeg is the only tropical fruit to produce two different spices, and although the spices are closely related, mace contains a higher concentration of certain essential oils with a more intense aroma when compared to nutmeg. The nutmeg tree is also the source of several other products, such as essential oils, extracted oleoresins and nutmeg butter obtained by expressing the nuts. Nutmeg seed contains about 20% to 40% of the fixed oil known as nutmeg butter. About 75% of nutmeg butter consists of trimyristin, a chemical compound and saturated fat, that is insoluble in water and is the triglyceride of myristic acid. 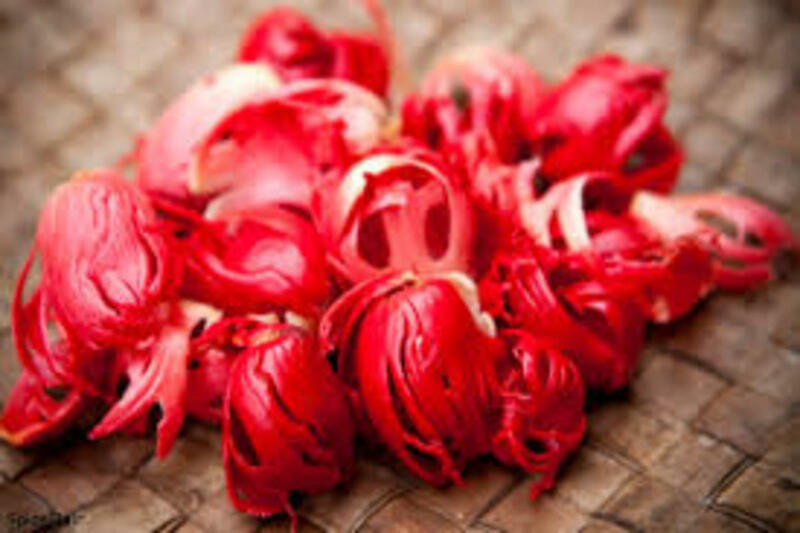 Studies suggest that like nutmeg, mace may help to treat and prevent cancer by inhibiting the formation of blood vessels that feeds cancer tumors. Journal of Food Science published a study in it's April 2012 issue showing that myristicin compound inhibits the growth of colon cancer cells. Mace consists of high concentrations of volatile oil compounds containing myristicin geraniol and pinene, these compounds are the source of the potent medicinal properties attributed to mace. Due to the high concentrations of volatile oil compounds, it is recommended that mace should not be taken in excess, no more than 1 teaspoon at any given time. Mace may cause dermatitis in people who are sensitive. Women who are pregnant or breastfeeding should also avoid mace. Vitamins A, a good source of Vit. A, 100 g of mace powder provides 800 IU, almost nine times greater than nutmeg seed. Breath Freshener, effective against bad breath. Add a tiny pinch to a toothbrush to destroy bacteria that causes bad breath. Anti-microbial, contains macelignan, a natural antibiotic agent also have therapeutic potential as a cancer chemopreventive agent. The common name is Ginger, the Latin name is Zingiber officinale from the family of Zingiberaceae. 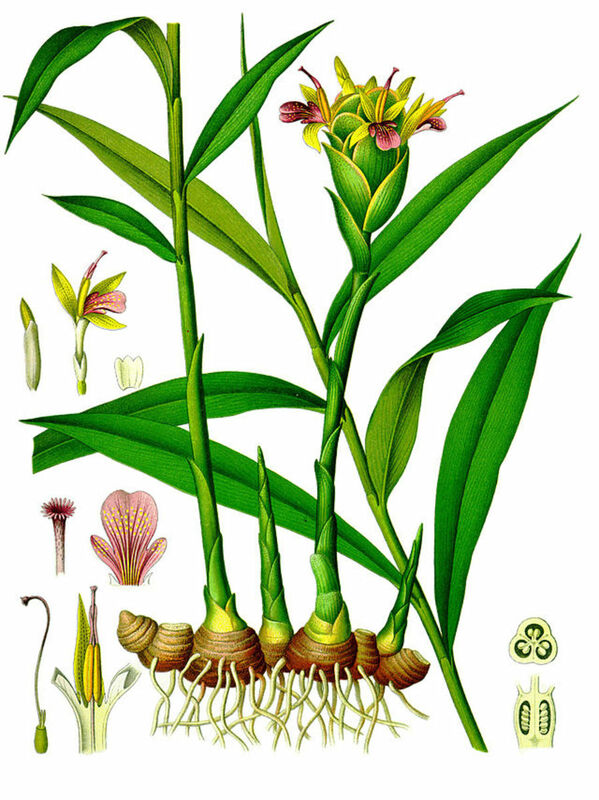 The rhizome or underground stem of the ginger plant is an aromatic spice commonly used for cooking and medicinal purposes. 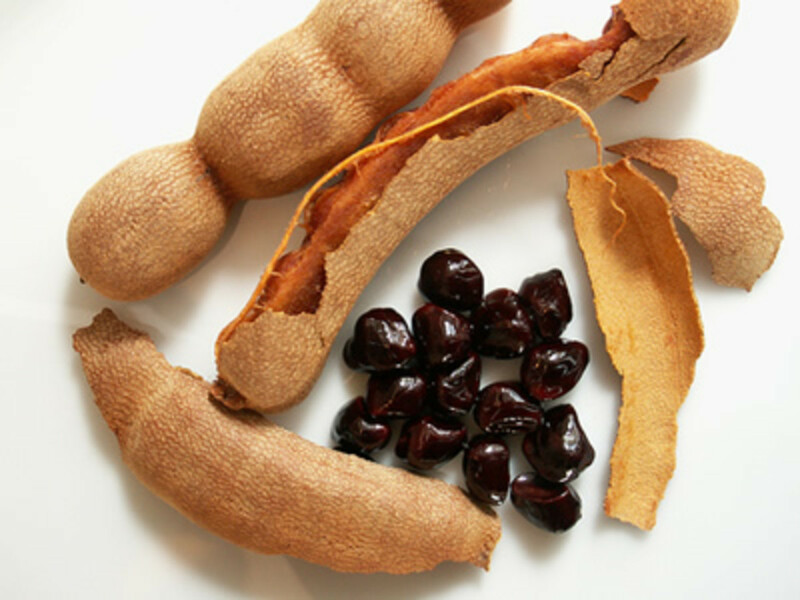 Ginger dates back thousands of years to the Sanskrit word srngaveram, meaning 'horn root' due to its appearance. Ginger is indigenous to southern China, the warm pungent aromatic spice was exported to Europe via India through the lucrative spice trade in the first century. The origin of the word ginger comes from the Old English gingifer, from Medieval Latin gingiber and Greek ziggiberis. Indian and Chinese have used ginger as a tonic root for over 5000 years in the treatment of countless ailments, India is currently the largest producer of ginger. Ginger is used in many different forms, e.g., fresh, dried, powdered, pickled preserved, crystallized or candied. Studies suggest that ginger and its metabolites appear to accumulate in the gastrointestinal tract, exerting many of it powerful therapeutic and preventive action in this area of the body. The anti-inflammatory and powerful antioxidant activities of ginger and the ability to inhibit prostaglandin biosynthesis makes this spice potentially very important in the treatment of conditions like arthritis. Ginger is said to be one of the most widely consumed spices in he world, yet, there is still much to learn about ginger. Studies suggest that the spice can be safely used in the short term to relieve pregnancy-related nausea and vomiting, however, the results are mixed when it comes to nausea caused by motion, chemotherapy or surgery. In 2007, the University of Arizona conducted studies on the anti-inflammatory properties of ginger and found that the compound known as gingerol effectively reduced the production of anti-inflammatory chemicals that contributes to inflammation. A Johns Hopkins University study revealed that compounds in ginger can suppress inflammatory chemical enough to reduce the need for pain-relieving medication. The effectiveness of ginger in the treatment of rheumatoid arthritis, osteoarthritis, or joint and muscle pain warrant further research, the oily resin found in the rhizomes of ginger known as oleoresin are known to contain a variety of incredible physiological and pharmacological activities. Helps to neutralize stomach acids. Speed up movement of food in the digestive system. Exerts several effects on gastrointestinal tract which leads to improvement in gastrointestinal symptoms. (Platel & Srinivasan 1996). (Blumenthal et al 2000). Many studies suggests powder of extracts may be safe and effective in treating nausea and vomiting in pregnancy. Shown to reduce cell death in all ovarian cancer cells to which it was applied. The inhibitory effects of ginger in tumour development have been demonstrated in animal and human model and human cell lines. (Kim et al 2005). Lower cholesterol levels by interfering with cholesterol biosynthesis. May prevent blockage of the blood vessels that can cause heart attack and stroke. Demonstrates significant lipid lowering activity in animal model and double-blind clinical trials. (Thomson et al 2002). Powerful antioxidant properties. Research suggests that ginger extract exerts some degree of immunomodulatory activity. (Ahui et al 2008, Imanishi et al 2006, Tripathi et al 2008). Ginger may block prostaglandin action and help to reduce muscle contraction, also effects some hormones with anti-inflammatory effect. Gingerol and derivatives represent a new class of platelet activation inhibitors. (Koo et al 2001). Prevent morning sickness. May be useful in treating nausea induced by Chemotherapy. Demonstrates anti-emetic activity in human studies and experimental models. (Abdel-Aziz et al 2006, Kawai et al 1994). Effective in preventing both joint inflammation and attenuating cellular destruction. (Funk et al 2009). Test shows hypoglycaemic activity for ginger. Improve blood lipids, lower glucose, stimulates beta cells to release insulin and control body weight. 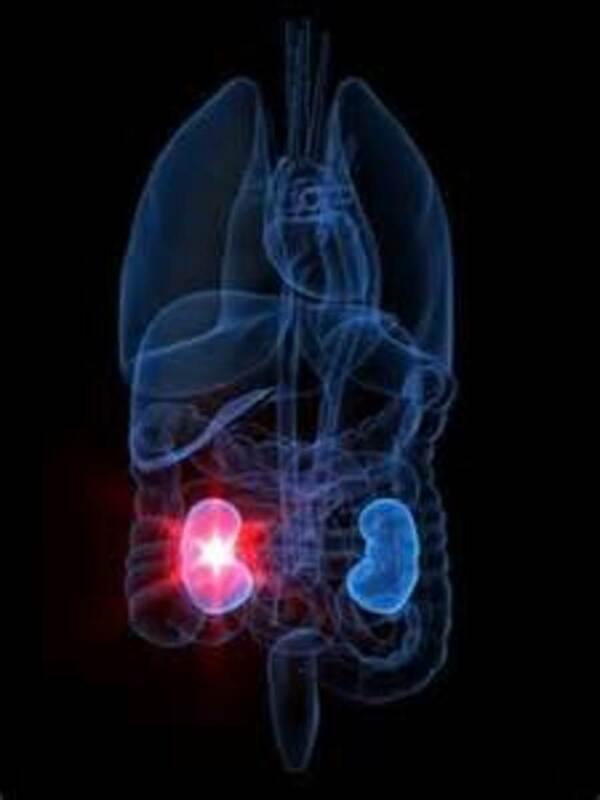 Ginger resulted in significent reduction in proteinuria, enuresis, thirst and sustained maintenance of initial weight. (Al-Amin et al 2006). The anti-obesity action of ginger may be a result of slowed intestinal absorption of dietary fat. 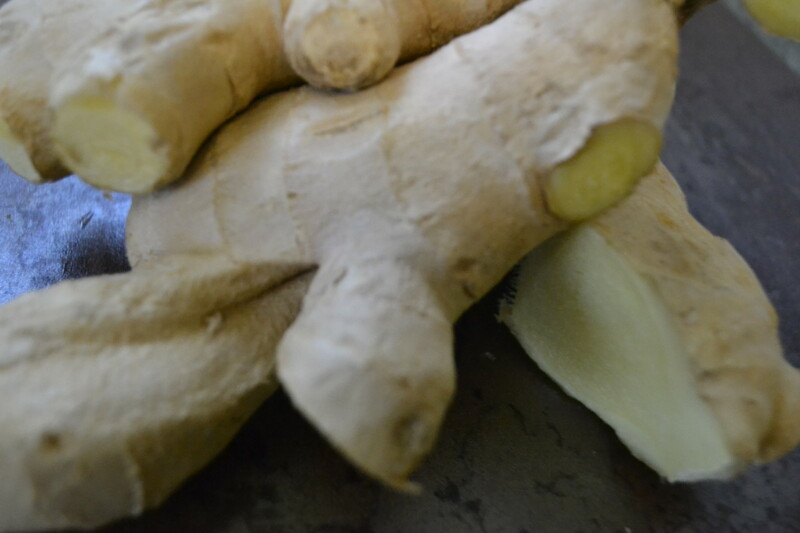 Ginger extract was found to be comparable to sulfasalazine in attenuating colonic mucosal injury. Showed valuable effect of ginger extract against acetic acid induced ulcerative colitis, possible antioxidant and anti in-inflammatorey properties. (El-Abhar et al., 2008). I was totally taken aback by the Dutch practices....at that time. You certainly filled in much information that I did not know. Hi Shyron, it's always a pleasure to see you. Thanks for reminding me to stock up on ginger, there's a distinct nip in the air and my old joints are beginning to ache. :) I'm glad you found the hub useful. I haven't tried ginger in coffee, but ginger tea is warming and delicious with honey. Jo, you really put a lot of research into this very informative hub. I bought some Ginger yesterday. I have had Ginger ale and Ginger Snaps, when I have to go to the hospital for migraines, they give me Ginger ale. I bought a small piece and sliced and hubby and I both tried a tiny slice, oh....is it hot. but I put some in my coffee and it pretty good. So far no side-effects. Thank you Jo, really useful. Kim, thank you so much for stopping by and for the wonderful comment, you're far too generous. HODT worthy or not, it is friends like you who makes my day. I hope you're well and enjoying the summer. Always a pleasure to see you here, best wishes always. FASCINATING! I had no idea about the mace. Definitely HOTD worthy! Voted up and shared. Awesome as always. Hi Rachel, thanks for taking a look and for the kind share and vote. Those spices really shout celebration, don't they? Always great to see you. Best wishes always. I love all of these spices, and you're right, the wonderful aroma that greets you when you enter a house that something baking in the oven using some or all of these spices, is amazing. Thanks for sharing. I voted up. Hi Patricia, yes, nutmeg can spice up even the dullest of food, I'm glad you found the hub useful. Thank you so much for reading and commenting, always a pleasure, my best to you. Great spices all of these. I must admit I really enjoy using nutmeg in soups and chili to give an unexpected little hint of flavor you find so tempting. I did not know of all of these great healthful benefits so thank you for providing that information. Hi Lee, thank you for reading and commenting. Yes, nature provides what we need, we simply need to look. Have a lovely day and my best to you. Hi Peggy, I'm please to know that you found the hub useful and learned something new. HOTD?...I wouldn't hold my breath. :) While there are people like yourself who find the hubs useful, I'll be happy to keep doing them. Thank you for taking a look and for the comment, vote and share. Much appreciated, my best to you. 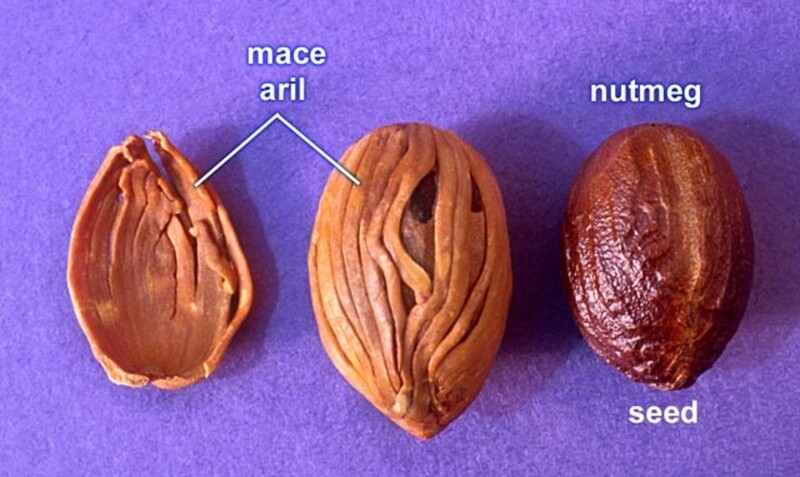 I had no idea that mace was the outer covering of the nutmeg seed. All three spices mentioned certainly have wonderful health benefits if not over done. You packed so much information into this hub! It should be a HOTD! Pinning this and will also share in addition to up votes. Vocalcoach, do stop by as often as you like, it's always a pleasure to see your smiling face. We're only just beginning to learn how important a role herbs and spices can play in maintaining good health, but we need more comprehensive research, until them, everything in moderation. Take care and my best as always. Hi Audrey, ginger and nutmeg are much more interesting than we give them credit for.Thank you for stopping by, I hope you're having a lovely day, my best to you. I'm returning once again for a read of your excellent hub on these spices. I tend to think of spices in terms of healthy so it's important to know there are side effects. Hi Flourish, I'm sure your efforts will be well rewarded. 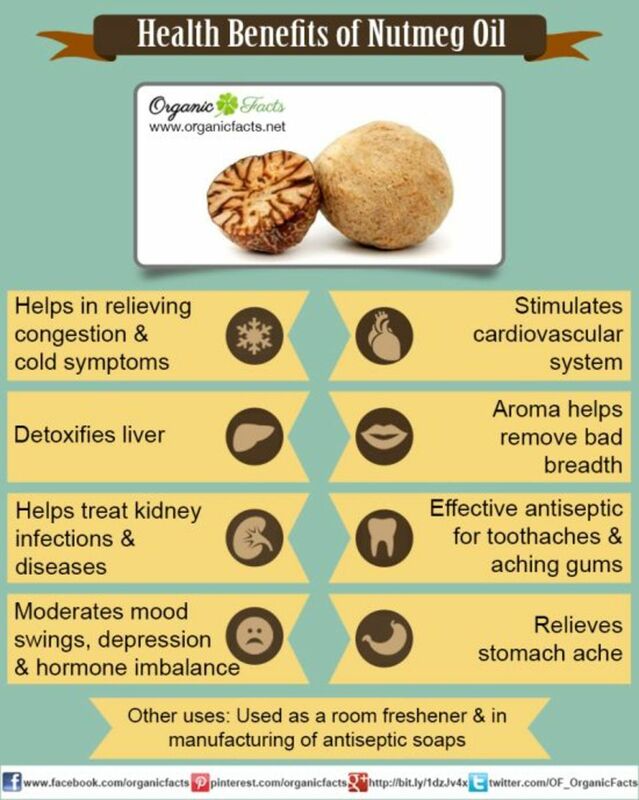 The health benefits of nutmeg oil ranges from a cure for bad breath to brain tonic to help remove exhaustion and stress, I'm sure you'll find it helpful. Lovely to see you, my best always.. I not only love cooking with these but also after reading your hub I am thinking the essential oils may be worth exploring. Thanks! Hi Nell, I've been using a lot of ginger recently for the flu, both myself and my husband had it really bad, I drank lots of ginger teas with an occasional pinch of nutmeg, lots of honey and lemon. My husband doesn't, like ginger so he drank honey and lemon with the odd lemsip. Long story short, although we experienced the same symptoms, my flu that started about one week after his is all but gone while he is still coughing for England, bless his little cotton socks. It's good to know that you found ginger useful for motion sickness. Thank you for reading and commenting, much appreciated, best wishes always. mdscoggins, thank you for taking the time to read and for the wonderful comment, it makes it all worthwhile. These spices are cleverly balanced, we can use them, but if we attempt to overdo it, they will bite back. You are correct, it's human nature to think that if a little is good, more must be even better, unfortunately it's not always the case. Lovely to see you, my best always. Hi ChitrangadaSharan, we don't use nutmeg and mace in cooking nearly as much as we once did, we tend to go looking for these spices mainly for holidays and special occasions. The oil is still widely used in aromatherapy, ointments, dental products perfumes, soaps etc., such a pity about the side effects when taken in large amounts or prolonged use. I hope there will be more large scale studies into these spices. Thank you so much, always a pleasure to see you. My best always. Very useful and informative hub about Nutmeg, Mace and Ginger. Ginger is widely used in Indian cuisine whereas Nutmeg and Mace are also used in recipes but not too often. Thanks for enlightening us about the side effects. As usual a very well researched and nicely presented hub! Lovely pictures too. Voted up as useful! Hi Venkatachari, I appreciate that you took the time to stop by, glad the hub was useful. Thank you for reading, for the generous comment and the vote. Alicia, thank you so much for taking the time, much appreciated. I'm glad you found the hub useful, the history of herbs and spices are fascinating, it was fun to do. I hope all is good with you, take care and best wishes. Hi Faith, I could do with your secret recipe right about now. In the UK, the flu virus have mutated, out-smarting the people who put this year's flu jab together, many of us are suffering terribly. Ginger, nutmeg, lemons and honey not to mention a good dollop of rum seem to help, it may not stop the flu but certainly packs a good punch. ;) Thank you for stopping by and for the generous share, my best always. Hi Ruby, the European went NUTS for nutmeg. The Dutch wiped out whole populations of indigenous islanders. The thirst for nutmeg wasn't much different to gold fever. Thank you for taking a look at this, much appreciated. My best as always. It's great, Jo Alexis. A wonderful and useful hub with so much well researched rich content. You have done a great job. I appreciate you. This hub contains a lot of useful and interesting information, Jo! Thank you for doing so much research and for sharing all the details. I love nutmeg and ginger but have never heard of mace before. You have provided great insight into all three here. Thank you for the warnings too of the dangerous side effects if used too much. I love cinnamon too as a sugar substitute. I have a great Hoddy Toddy Cold remedy recipe which has some of these ingredients and then one added one, which I will not mention LOL. It works overnight though! Yes, too much of anything is bad, as Jackie points out. Even too much Vitamin A can be so very dangerous. Well-written and very information article as always, Jo. Very informative hub Jo. I knew little about nutmeg, ginger or mace. Amazing how many ailments can be alleviated with their use. Thank you. The history was very interesting, people were actually beheaded when found with the seeds, amazing! Great article! MsDora, I appreciate you taking a look at this. I don't want to put people off these incredible spices, but the more we know about them the safer we'll be. We can still reap the benefits when we use them in moderation. Ginger, nutmeg and cinnamon do add a little magic to Caribbean cooking. Always a pleasure, my best to you. Although nutmeg and ginger are popular spices in Caribbean households, there is so much of this information we do not know. Will share. Thanks and voted up! Hi Kidscrafts, I have missed you. I hope all is well, great to see you back. I do like a pinch of nutmeg in some dishes, the spice is very strong we don't need much to enjoy the flavours. I like Chinese food with ginger but I love crystallised ginger for the odd treat, the only problem is the sugar content. Lovely to see you back, thanks for taking the time to read and comment, glad you found it useful. Happy New Year to you and all the best for 2015. I have been away for a while now but I couldn't resist coming today when I saw this title. I never heard of "mace" but I use nutmeg sometimes is mashed potatoes and I love ginger in Chinese dishes or with fish :-) Too bad that those ingredients that are so good to taste can have a bad effect when we use too much of it! Great article as always! By the way... Happy New Year, Jo! Hi Devika, yes those spices are very interesting with a lot of history behind them. Thank you so much for reading and commenting, always nice to see you. I hope Croatia isn't to cold at the moment, it's windy and raining here. Take care and my best to you. Interesting and informative! I have learned and still learning about nutmeg and ginger. I like the photos and you certainly presented the hub in such professional manner. Voted up! Frank, glad you found the hub useful and easy to understand and thank you for the vote and comment, always appreciated. Bill, I feel like I've known you for years, I hope we will meet one day. Thanks for the trust it means a lot. My very best to you and Bev. It's always good to hear from a health expert on these things, and even though we have never met, I trust you and your opinions. Thank you for this well-written and informative article, and blessings today and always. Hi Suzette, nice to see you, I hope all is well. Glad to know you visited Grenada, a beautiful little spot. It's interesting visiting the farms where the nutmeg and cocoa grows. I believe they peoduce a product made from nutmeg oil that's proven to be an effective treatment for arthritis. Nut-MedT, I sould add it to the hub. Thank you so much for taking a look, always good to see you, the very best for 2015. 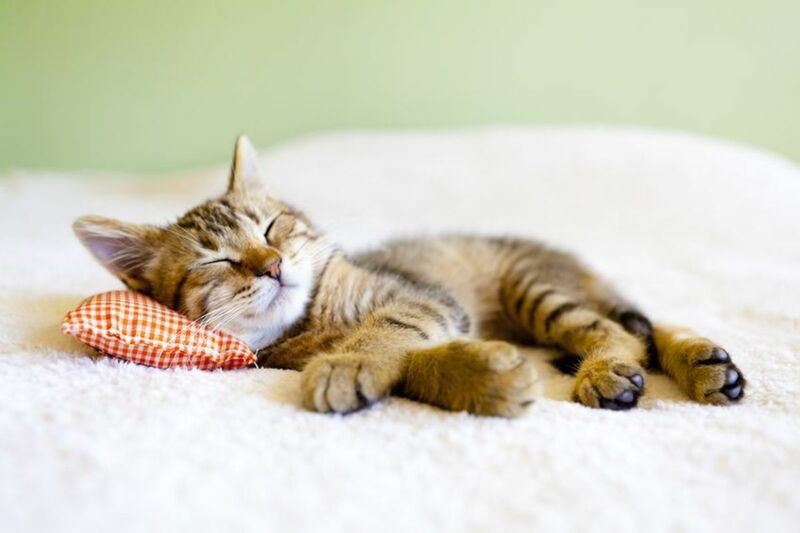 Hi Joyfulcrown, a pleasure to see you! I've been on the ginger, honey and lemons also for the flu. Nutmeg is great but not to much. Thank you for taking the time to read and leave a momment, much appreciated. My best always. Lady_ E so nice to see you! Glad you found the hub useful. Those beauties can spice up our lives as long as we use them cautiously in moderation. Appreciate you stopping by and commenting. My best to you. Hi Jackie, thank you for stopping by and for the great comment. By the way, you are spot on about the very things that does you good, they can also be a curse when taken in excess. Nature likes balance, as you've rightly said, everything in moderation. It's amazing how many herbs and spices are mentioned in the Bible, I found an interesting quote about cinnamon to use in my next hub. Take care now, I hope you're feeling much better, my best always. Hi Ann, many of the herbs and spices we use as a matter of course are really extraordinary. While we clearly need more research into the mechanism of how they actually work, available research shows that spices like ginger do have anti-inflammatory propertise and an excellent source of antioxidant. In the case of ginger, only pomegranate and some berries contains more. Good to know that ginger worked well for both yourself and your husband. Appreciate you taking the time, my best to you both. Another stellar hub on spices, Jo. This is great - so comprehensive. I have been to Grenada and seen the spice shops. They are heavenly. Thanks for sharing your knowledge with us about these spices and I am glad to hear some of these help with inflammation which is my problem at the moment. Very interesting information. I drink a cup of ginger tea everyday so I was familiar with ginger but the information about nutmeg was new to me. Thank you. Useful to know and very informative. Thanks. I should start using it. Outstanding article as always. Up and shared! Absolutely fascinating and really useful. It's important to know the side effects of such things. I love nutmeg but didn't realise it had so many side effects. My partner uses a little ginger to alleviate arthritis and I've used it against sea-sickness. Well done, Jo! Great read.